This substantial dish tastes delicious and takes very little time to assemble. Preheat the oven to 200°C, gas mark 6. Heat the oil in a large non-stick frying pan until very hot then add the gammon strips. Cook for 3-4 minutes until golden, then stir in the courgette slices and cook for 2 minutes until lightly browned. Meanwhile, cook the gnocchi according to pack instructions. Drain then add to the pan with the gammon and courgette. Gently stir in the cheese sauce. Transfer to a baking dish and sprinkle the cheese over the top. Bake on the hottest shelf of the oven for 15-20 minutes, until golden and bubbling. Serve immediately with Waitrose Continental Salad and a fresh dressed tomato and basil salad. 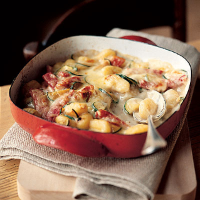 Make individual servings by dividing the mixture between 2 small gratin dishes.